The signing ceremony of a joint statement in Singapore on June 12, 2018. Li Peng/Press Association. All rights reserved.Two vain men met in Singapore, posed for the cameras and signed a joint statement. 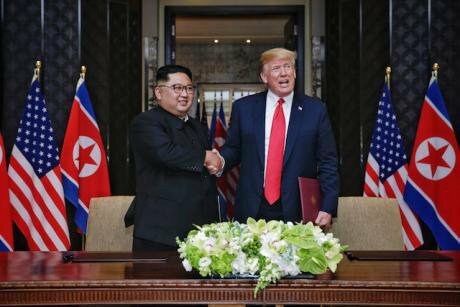 Neither US President Donald Trump nor North Korean dictator Kim Jong-un deserve to be trusted, so why should we be cautiously hopeful that the Singapore Summit might this time lead to more sustainable peace and disarmament in the Korean Peninsula? The answer came in a text from a South Korean friend: "Now we can start to hope." The mood on that women's peace walk was defiant. "Don't let Trump derail our peace train!" shouted some, and "Korean people take back the power to make peace!" 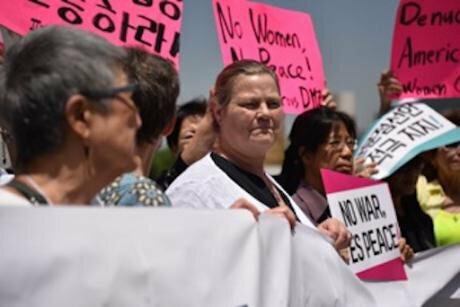 The international delegation from Women Cross DMZ called on Kim and South Korean President Moon Jae-in to "Pick up the phone and keep your peace process going." As we wearily headed back to Seoul, the news broke that Moon and Kim had done just that – they had quietly met in the demilitarised zone (DMZ) just a few kilometres north of where we'd been walking. This is why there is cause for hope now, despite deep scepticism about the personalities, purposes and politics of Trump and Kim. Because it isn't just about these two narcissistic egos. It's about the hopes and fears of 80 million Korean people. Trump is someone who likes to take credit, not be left behind as the train pulls forward and leaves him standing, looking foolish. He likes to crow (especially over his Democrat predecessor, as we saw in his press conference before leaving Singapore). The partisan nature of US politics enabled Nixon to reach out to China in 1972 – he would have been the first to attack any Democrat president who tried to open that important strategic door at the time. And so it is with Trump. But now he'll need to face down the wreckers who are stuck in the past. Reactions to the Joint Statement are, unsurprisingly, quite mixed. Across different news coverage, some have dismissed it as "nothing new" or "insubstantial", while others have spluttered that Trump has "gone too far" and "got nothing in return". So let's look more closely at the four key commitments that form the operative substance of the Trump-Kim statement. 1) The first paragraph links the "desire of the peoples" of the United States and North Korea "for peace and prosperity". Trump got elected on his promises of increased prosperity for "America First", and he approached this summit by boasting of his business acumen as a deal maker. The emphasis Kim put on economic development in the Inter-Korean meetings signalled his recognition that he has to do more to lift North Korea out of the abject poverty, starvation and under-development caused by decades of isolation, economic rigidity and sanctions. Kim took over from his father in 2011, as dictators in the Middle East were overthrown, and he is smart enough to realise that if he doesn't make changes in North Korea, the same fate could befall him personally, regardless of how many nuclear weapons he has. 2) Next, Trump and Kim promise to "join their efforts to build a lasting and stable peace regime on the Korean Peninsula". In relation to this, Trump surprised many by publicly committing to halt US wargames in the region. He was referring to what the US and its "nuclear umbrella" allies prefer to call "military exercises". Euphemisms, however, have not diminished the purpose or the risks and miscalculations that can ensue from such military practices and games, as illustrated by NATO's 1983 "Able Archer" wargames and other nuclear close calls. Trump's promise was undoubtedly a response to Kim's concerns, but also echoes the views of South Korean, Japanese and international advocates who have long argued that progress towards peace and denuclearization necessitates dialling down the military threats to North Korea as well. North Korea's nuclear programme and missile tests are both consequence and cause of the heavy US military presence in South Korea, provoking and also serving to justify new US-South Korean missile defence bases built, most recently in Jeju, a formerly designated "island of peace". Over 25,000 US military personnel continue to serve in some 15 bases in South Korea, and though no landbased nuclear weapons are supposed to be stationed there since 1991, nuclear-armed submarines and ships continue to enter Korean waters and ports. 3) Trump and Kim reaffirmed the 27 April Panmunjom Declaration that was agreed between Moon and Kim, underscoring North Korea's commitment "to work towards complete denuclearization of the Korean Peninsula". This is very important as it recognizes and upholds the role of Moon and South Korea in taking this whole process forward. Again we saw pundits on American news programmes complain that the absence of the mantra CVID (complete, verifiable, irreversible dismantlement) as well as the reference to the Korean Peninsula and not just North Korea, showed that Trump got conned into giving away the store. On the contrary, the complete denuclearization of the Korean Peninsula is a long-standing objective of all who recognise that peace and nuclear disarmament are not going to happen if North Koreans feel under constant threat from US nuclear weapons, as is the case at present. The use of the CVID mantra as a precondition by American negotiators contributed to the failure of past diplomatic efforts, including the Six Party Talks. Experience shows that cooperative action rather than coercive threats are most conducive to achieving comprehensive, verified and irreversible disarmament. To implement the Singapore and Panmunjom commitments, what is needed is a collective plan to denuclearize security relations across North-East Asia. The International Campaign to Abolish Nuclear Weapons (ICAN), holders of the 2017 Nobel Peace Prize, have put forward a roadmap for denuclearizing the Korean Peninsula, incorporating the internationally endorsed legal prohibitions, obligations, verification and monitoring processes relating to the UN's 2017 Treaty on the Prohibition of Nuclear Weapons (TPNW), the Comprehensive Test Ban Treaty (CTBT) and the nuclear Non-Proliferation Treaty (NPT). 4) The fourth commitment – to recover and repatriate the remains of prisoners of war and people designated as "missing in action" – fulfils one of Trump's promises to US veterans. So that's what's on offer. Neither Trump nor Kim deserve to be trusted, we know. Both have broken undertakings they or their nations' leaders undertook in the past, including the NPT, the Paris Climate Accord, and the Iran nuclear deal. But however unsavoury the chief protagonists may be, trashing the Singapore Summit accomplishes nothing but further stalemate and the risk of nuclear war. Building disarmament and peace won't be a quick fix for anyone. Nor can the world let them go back to their risky games of threatening nuclear war and blaming each other when they feel thwarted, frustrated or annoyed. All sides need to seize these opportunities, reframe what is possible and achievable, and move past long entrenched obstacles. To fulfil the Panmunjom and Singapore commitments, we all have to play our parts.